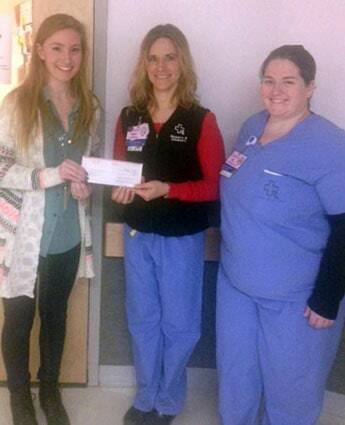 Olivia Lyons, a senior at Rutland High School presents a check to Sarah Bache and Amy Walters of the Women and Children’s Unit at RRMC. RUTLAND – Rutland High School’s chapter of the National Honor Society presented a check for over $500 to the Women and Children’s Unit at Rutland Regional Medical Center. Students organized a bowling event that raised more than $1,000. Proceeds were divided between Rutland Regional’s Women and Children’s Unit and the Community Cupboard. “Our goal is to provide quality care to our patients. Generous donations like this will help us to support our pediatric patients and babies in the unit,” says Sarah Bache, BSN, RN, CLC, RNC-OB, Clinical Nursing Manager.